Black 1/2" x 1/2" push connect 90° replacement union for the Deluxe BRS Carbon and GFO Reactor. These are Mur-lok dual EPDM O-ring fittings. I used these to route tubing on the BRS media reactor. They are super easy to install. I would definitely recommend them. These little guys are awesome when you need to run reactor lines in semi-rigid tubing. Easy to install and remove without leaks or complaints and the black ones make deluxe installs look more professional even if your not quite there. All tubing and connections should be black IMO, it just looks better. Super fantastic stuff! Works good, just ensure you push it far enough in or you'll cover everything with water! Much more effective than bendy straws. If you need to turn water 90 degrees this is your dude. If your plumbing any sort of media reactor you have to have a handful of these little guys and their straight connector buddies! Rather than struggle with your tubing making turns and right angle connections just order a few extra with your reactor, your fingers will thank you. *Quick tip* most of us will be using a pump similar to the Cobalt MJ line like the 1200, these connectors fit perfectly on the straight output tube of the pump. Makes it real easy to make a 90 degree connection to your pump! If you are setting up a GFO, carbon, or any other reactor (like the BRS Elite) these little guys will make it so much easier. In fact I would go as far as to say these are just as important as every other part from pump to reactor. I average 4-5 per install, they allow you to mount your pump where you want it, not just where the tubing bends. As an FYI I use the Cobalt MJ1200 on both my reactors, you can attach one of these 90's right to the pump output no tubing required! Easy to use just what I needed to route my reactor tubes in my sump. Works as it should. I had limited space and couldn't bend my r/o tubing in such a tight spot. This 90°elbow was the answer. These push connect fittings are basically plumbing for dummies. So easy to use and no leaks! Can these be used instead of slip pvc and solvent to plumb drain lines to a sump? 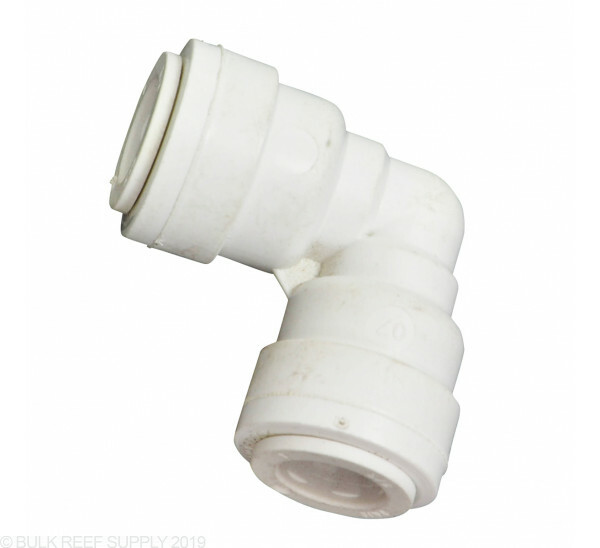 While polyethylene/pex tubing and mur-lok fittings certainly can be used for a variety of plumbing applications, including drains/returns, the sizes we currently stock would not likely be appropriate for the flow rates commonly used in aquariums. Do you have these in black to go with the carbon reactor ones? 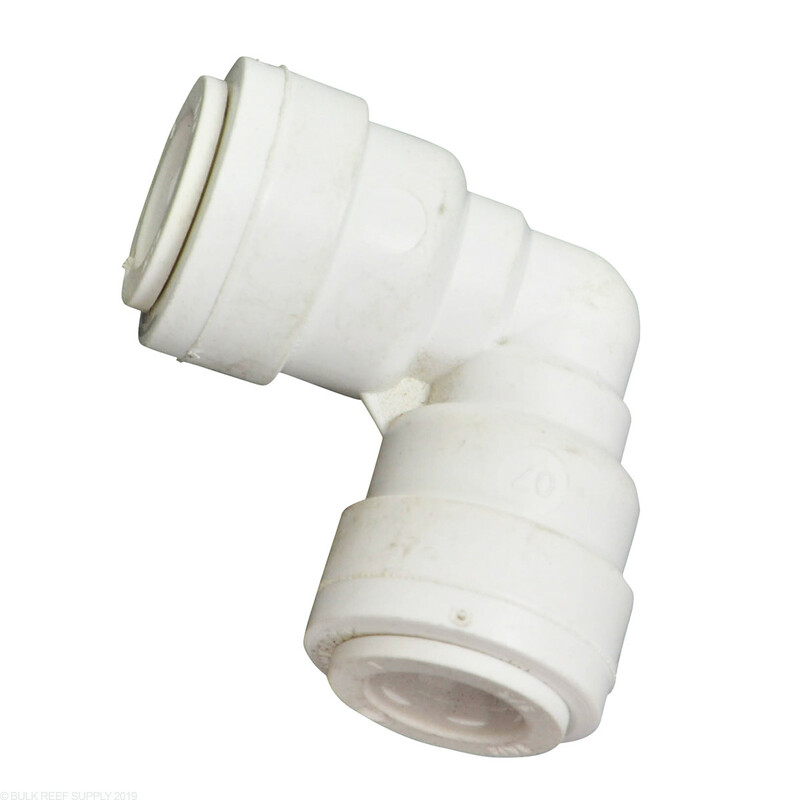 Can the 1/2" elbow fittings connect directly to the output of a Cobalt MJ pump? Yes, these 1/2" push connect elbows will fit perfectly on at Cobalt MJ pump.